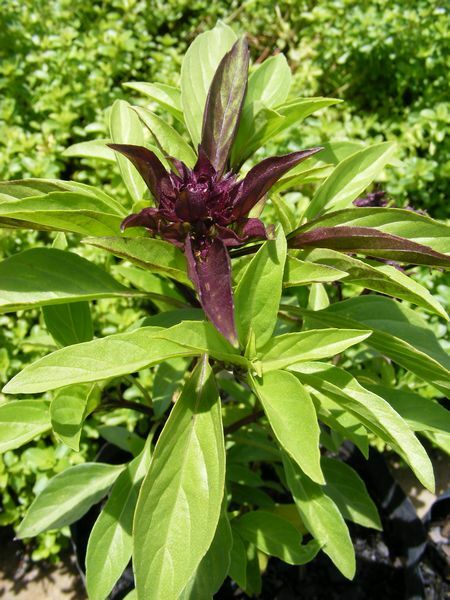 Annual with large, lush green leaves, square purple stems and deep purple flowers. Has a spicy aroma that is a cross between cinnamon and aniseed basil. Full sun and pH5 - 8. Pinch out growing tips to encourage bushiness and delay flowering. Excellent in thai cooking, tomato dishes, meat and brinjals. Superb with potato and onion stir fry. Add leaves and flowers to salad. Flavor pasta sauces (notably pesto), vegetables (especially beans, peppers) and soups. Pick throughout the growing season. 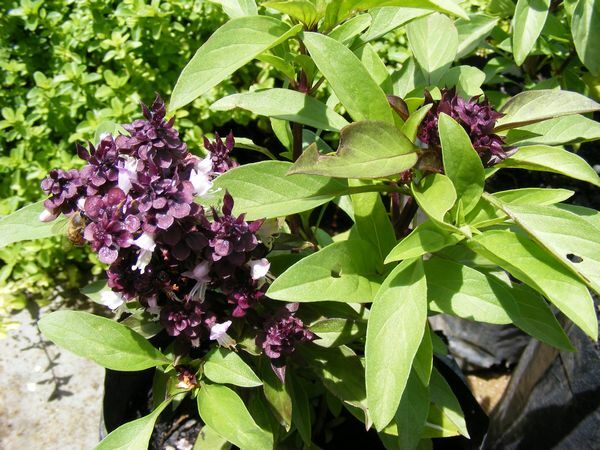 Restorative, warming and aromatic herb with mildly sedative action. Effective against bacterial infection and intestinal parasites. Lowers fever, helps migraine and feverish illnesses like colds and flu. Improves poor digestion: relaxes spasms, nausea, abdominal cramps and gastroenteritis. Helps insomnia, low spirits, anxiety and exhaustion. Treat acne, insect stings and skin infection. Use in companion planting to deter white fly.